SriLankan Airlines has returned to Australia for the first time since 2001 with the start of nonstop flights between Melbourne and Colombo. The inaugural service, operated by Airbus A330-300 4R-ALM, touched down at Melbourne Airport at about 1515 on Monday, following its 10-hour journey from Colombo. The aircraft was on the ground for about two hours before operating the return flight back to Colombo’s Bandaranaike Airport. SriLankan last flew to Australia in 2001, when it ended flights between Colombo and Sydney. AirLanka, which preceded what is now SriLankan, operated Colombo-Sydney-Melbourne-Colombo services with Lockheed L1011 Tristars in the early 1990s, according to the AirlineRoute website. There was a cricketing flavour to the inaugural flight, with Sri Lankan stars Kumar Sangakkara and Mahela Jayawardena travelling to Melbourne to help celebrate the resumption of nonstop service between the two countries. 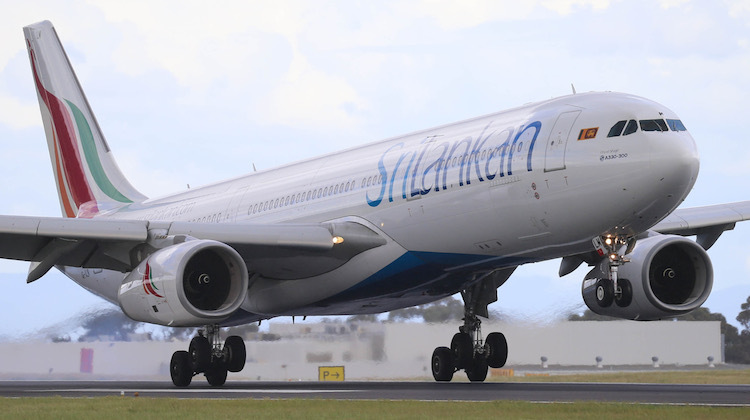 SriLankan chief executive Captain Suren Ratwatte, chairman Ajith Dias and Sri Lankan State Minister of Public Enterprise Development Lakshman Yapa Abeywardena also travelled to Melbourne on the first flight. The airline is hosting an event in Melbourne on Tuesday night to help promote the new route. Captain Ratwatte noted Australia was home to one of the largest Sri Lankan expatriate communities, many of whom lived in Melbourne. “We’re incredibly excited to be connecting Melbourne and Colombo like never before,” Captain Ratwatte said in a statement. Melbourne is the oneworld alliance member’s second-longest route behind its Colombo-London Heathrow flight. SriLankan is hoping its new flight will attract Australians travelling not just to Sri Lanka but also beyond to countries such as India and the Maldives. However a research note from aviation thinktank CAPA – Centre for Aviation highlighted the airline faces plenty of competition and challenges on that front. CAPA noted the Australia-Sri Lanka market, although growing, was still relatively small with 73,000 Australians travelling to Sri Lanka and 30,000 Sri Lankans visiting Australia in 2016. By contrast, there were more than 250,000 Australians and 250,000 Indians travelling annually between the two countries. “The local Melbourne-Colombo market is obviously not big enough to fill up the nearly 100,000 annual one-way seats (including more than 6,000 lie flat business class seats) that SriLankan will generate with the new daily flight,” the CAPA research note published on September 27 said. CAPA said SriLankan would need to improve its connectivity from Melbourne to India to take advantage of the larger Australia-India market. The research note said that of the 14 destinations SriLankan flies to in India, only four – Bangalore, Chennai, Delhi and Mumbai – will have short connections from and to the Melbourne flight at Colombo. Most of the oneworld alliance member’s Indian flights leave Colombo in the morning, resulting in an overnight layover on the outbound leg from Melbourne. Similarly, on the return sector, passengers travelling from India to Melbourne via Colombo face a wait of about six to seven hours at Bandaranaike Airport. “The issue of long layover times on most Melbourne-India city pairs puts SriLankan at a competitive disadvantage compared to other airlines offering one-stop products in the Melbourne-India market, which include AirAsia, Malaysia Airlines, Thai Airways and Singapore Airlines,” CAPA said, noting Air India also offered nonstop flights from Melbourne and Sydney to Delhi. “Only in the Melbourne-Bangalore and Melbourne-Chennai markets is SriLankan offering a similar transit time to those of the existing competitors. While the inaugural flight was operated by an A330-300, the smaller A330-200 will be operating the route on from Tuesday onwards. Whilst it is great to see new airlines flying to Australia and old routes being restored, it is rather noticeable that it is rarely, if ever, the Qantas Group taking the lead… such a regressive and reactive airline group rather than a progressive and proactive airline group. Hopefully this works out for SriLankan but I rather suspect that daily is a bit much to start with. SriLankan really need to mirror the Sydney schedule they had back in 2001. Either that or they totally rework the Indian bank hub. Relying on just 2 cities with immeadiate connections is just not going to cut it. Otherwise they will have to cut it back to 4 x weekly and rely purely on O&D between the 2 ports. It is great to see Suri keeping to his promise of commencing Melbourne flight. Welldone Sri Lankan. Yes, you may have to work out some adjustments to keep this moving on. I really hope they do well. Again and again we see the Asian carriers taking the lead in pioneering new routes and city pairs while our own national carrier lags behind and withdraws from markets. Frankly Qantas and Joyce are hopeless.